This year we are introducing class assemblies in which the children showcase what they have been learning in school. Parents are encouraged to come and see their children's assemblies which start at 9:05am and finish by 9:30. 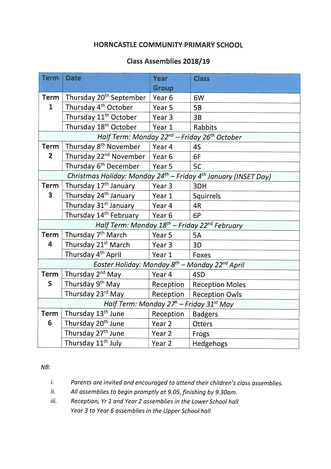 Dates of each classes assemblies are shown below. We look forward to seeing all of the brilliant performances.